A Japanese Halfie in Canada: Sayonara, Kuwait! Leaving Kuwait this past Thursday was difficult. I was leaving behind new friends I'd met since working for my new company and old friends I'd met through the university. This time I had absolutely no qualms regarding leaving Kuwait though. This past year I've gotten so sick (food poisoning, infections and skin problems), that I've actually been looking forward to leaving and getting healthy again. 1.) The AMAZING people I found. It sounds silly, but after living in Kuwait and trying to maintain relationships, you realize that finding good friends is extremely difficult. Without my Polish roomie and my Lebanese roomie, female companionship dwindled. However, the Georgian lady and I have successfully continued our friendship and hers has been the most important (female) one that I've experienced. She's an incredible person. 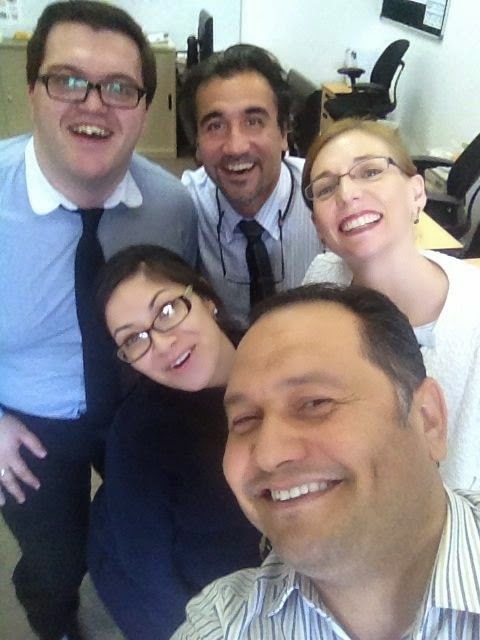 My co-workers at the most recent company I was at were some of my best friends as others came and went from my life in Kuwait. We laughed, challenged each other, shared stories and supported each other. They became my confidants and I feel like each and every one has a special place in my heart. Just as important were my students. I wasn't allowed to spend time with my students while I was teaching them, so when I had left my jobs or after completing a course/semester/etc., I would hangout with them (female and, SHOCK, male!). These students showed me the culture that I felt was so difficult to find in Kuwait. Talking to them, hearing about their lives, their journeys and their goals/dreams made me see that the cultural divide is great in many ways, but not in others. There is also the most obvious person who has made my life in Kuwait amazing and that's the Irish chef (and his friends). I would not have survived without him. No surprise there. Not sure of what I mean? Just go back to almost ANY previous post and you'll see...Actually, here are shots from dinner I had with a student of mine. 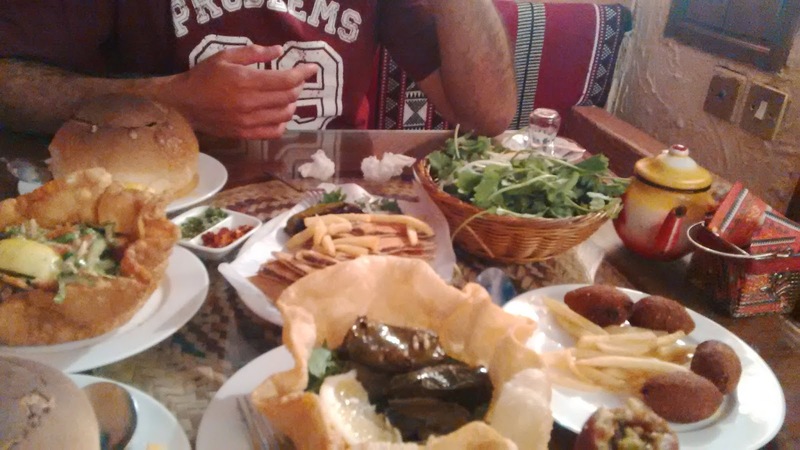 He took me into Salmiya where we went to an Arabic (Lebanese) restaurant that had private rooms. 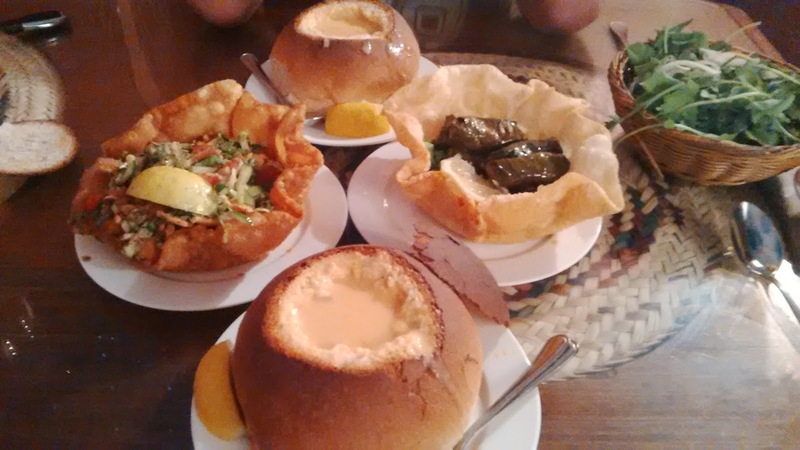 It was pretty cool and the food was good, although the highlight for me was the crab soup in a bread bowl. Heaven on earth. The buttery soup permeated the bread it was encased in making the bread soggy. Seriously a piece of heaven on earth. Other local favourites? mint lemonade, cheesy macadamia nuts (from Al Rifai specifically), dates, arabic sweets (baklava, namoorah/basbousa/hareesa, kanafeh, mamoul, etc...) and koshary (not local, but the only place I've ever eaten it). HELLO yummy crab soup in a bread bowl. I love you. According to many locals, this is the source of most of Kuwait's social problems. I disagree and on top of that, I love the diversity in Kuwait. I enjoy that, like Canada, diversity is obvious. I've met people from all over the world and it's made a lasting impression on me that I'll forever be thankful for. Although the dryness of the Gulf region kills me, I am enamored with the sun and the warmth it gives. I will most definitely struggle with acclimatizing myself to Canadian temperatures when I'm back home.